This article is about the chemical compound. For devices used to dispense it, see Pepper-spray projectile. Pepper spray (also known as capsicum spray) is a lachrymatory agent (a chemical compound that irritates the eyes to cause tears, pain, and temporary blindness) used in policing, riot control, crowd control, and self-defense, including defense against dogs and bears. Its inflammatory effects cause the eyes to close, taking away vision. This temporary blindness allows officers to more easily restrain subjects and permits people in danger to use pepper spray in self-defense for an opportunity to escape. It also causes temporary discomfort and burning of the lungs which causes shortness of breath. Although considered a less-than-lethal agent, it has been deadly in rare cases, and concerns have been raised about a number of deaths where being pepper sprayed may have been a contributing factor. The active ingredient in pepper spray is capsaicin, which is a chemical derived from the fruit of plants in the genus Capsicum, including chilis. Extraction of oleoresin capsicum (OC) from peppers requires capsicum to be finely ground, from which capsaicin is then extracted using an organic solvent such as ethanol. The solvent is then evaporated, and the remaining waxlike resin is the oleoresin capsaicin. An emulsifier such as propylene glycol is used to suspend OC in water, and pressurized to make it aerosol in pepper spray. High performance liquid chromatography (HPLC) is used to measure the amount of capsaicin and major capsaicinoids within pepper sprays. Determining the strength of different manufacturers of pepper sprays can be confusing and difficult. Statements a company makes about their product strength are not regulated. A method using the capsaicin and related capsaicinoids (CRC) content of the product is unreliable as well, because there are six different types of capsaicinoids, causing different levels of irritation. Manufacturers do not state which particular type of capsaicinoids are used. Personal pepper sprays can range from a low of 0.18% to a high of 3%. Most law enforcement pepper sprays use between 1.3% and 2%. The federal government of the United States has determined that bear attack deterrent sprays must contain at least 1.0% and not more than 2% CRC. CRC does not measure the amount of OC within the formulation. Instead, CRC is the pain-producing component of the OC that produces the burning sensation. The federal government of the United States makes no mention of Scoville heat units (SHU) or OC in their requirements, only CRC (only for bear attack deterrent sprays). But, there are countries (Italy, Portugal and Spain - see below, under "Legality") and a few states within the US that do mention OC limitations. Some manufacturers may show a very high percentage of OC and, although OC is the active ingredient within the formulation, it does not indicate pepper spray strength. High OC percentage also indicates that a spray has more oil content; which, can possibly use lower grade pepper oils (but, more of it), or lower grade capsaicinoids (within the major CRCs) and also has less ability to soak and penetrate skin than a formula with a less, but higher-quality, pepper oil, because oil has hydrophobic properties. The OC percentage measures only the amount of chili oil extract contained in the defense spray, not the strength, pungency or effectiveness of the product. Other companies may show a high SHU. The SHU is a measurement of the base resin compound and not what comes out in the aerosol. The rated irritant effect of the resin may be diluted depending on how much of it is put in the can. Widely used as a self-defense chemical agent spray in Russia. Its effectiveness compared to natural pepper spray is unclear. Used by Chinese police units and security guards. It is defined as a "restricted" weapon that only police officers as well as approved security can use. However, the law does not forbid the civilian to purchase and possess any non-police used pepper spray. Pepper spray is an inflammatory agent. It inflames the mucous membranes in the eyes, nose, throat and lungs. It causes immediate closing of the eyes, difficulty breathing, runny nose, and coughing. The duration of its effects depends on the strength of the spray, but the average full effect lasts from 20 to 90 minutes, but eye irritation, redness and tears can last for up to 24 hours. The Journal of Investigative Ophthalmology and Visual Science published a study that concluded that single exposure of the eye to OC is harmless, but repeated exposure can result in long-lasting changes in corneal sensitivity. They found no lasting decrease in visual acuity. The effects of pepper spray are far more severe, including temporary blindness which lasts from 15–30 minutes, a burning sensation of the skin which lasts from 45 to 60 minutes, upper body spasms which force a person to bend forward and uncontrollable coughing making it difficult to breathe or speak for between 3 and 15 minutes. For those with asthma, taking other drugs, or subject to restraining techniques that restrict the breathing passages, there is a risk of death. In 1995, the Los Angeles Times reported at least 61 deaths associated with police use of pepper spray since 1990 in the USA. The American Civil Liberties Union (ACLU) documented 27 people in police custody who died after exposure to pepper spray in California since 1993. However, the ACLU report counts any death occurring within hours of exposure to pepper spray. In all 27 cases, the coroners' report listed other factors as the primary cause of death, though in some cases the use of pepper spray may have been a contributing factor. The US Army concluded, in a 1993 Aberdeen Proving Ground study, that pepper spray could cause "[m]utagenic effects, carcinogenic effects, sensitization, cardiovascular and pulmonary toxicity, neurotoxicity, as well as possible human fatalities. There is a risk in using this product on a large and varied population". However, the pepper spray was widely approved in the US despite the reservations of the US military scientists after it passed FBI tests in 1991. As of 1999, it was in use by more than 2,000 public safety agencies. The head of the FBI's Less-Than-Lethal Weapons Program at the time of the 1991 study, Special Agent Thomas W. W. Ward, was fired by the FBI and was sentenced to two months in prison for receiving payments from a peppergas manufacturer while conducting and authoring the FBI study that eventually approved pepper spray for FBI use. Prosecutors said that from December 1989 through 1990, Ward received about $5,000 a month for a total of $57,500, from Luckey Police Products, a Fort Lauderdale, Florida-based company that was a major producer and supplier of pepper spray. The payments were paid through a Florida company owned by Ward's wife. Pepper spray has been associated with positional asphyxiation of individuals in police custody. There is much debate over the actual "cause" of death in these cases. There have been few controlled clinical studies of the human health effects of pepper spray marketed for police use, and those studies are contradictory. Some studies have found no harmful effects beyond the effects described above. Direct close-range spray can cause more serious eye irritation by attacking the cornea with a concentrated stream of liquid (the so-called "hydraulic needle" effect). Some brands have addressed this problem by means of an elliptically cone-shaped spray pattern. For individuals not previously exposed to OC effects, the general feelings after being sprayed can be best likened to being "set alight." The initial reaction should the spray be directed at the face, is the completely involuntary closing of the eyes (sometimes described as leading to a disconcerting sensation of the eyelids "bubbling and boiling" as the chemical acts on the skin), an instant sensation of the restriction of the airways and the general feeling of sudden and intense, searing pain about the face, nose, and throat. Coughing almost always follows the initial spray. Subsequent breaths through the nose or mouth lead to ingestion of the chemical, which feeds the feeling of choking. Police are trained to repeatedly instruct targets to "breathe normally" if they complain of difficulty, as the shock of the exposure can generate considerable panic as opposed to actual physical symptoms. Capsaicin is not soluble in water, and even large volumes of water will not wash it off. In general, victims are encouraged to blink vigorously in order to encourage tears, which will help flush the irritant from the eyes. To avoid rubbing the spray into the skin, thereby prolonging the burning sensation, and, in order to not spread the compound to other parts of the body, victims should try to avoid touching affected areas. There are also wipes manufactured for the express purpose of serving to decontaminate someone having received a dose of pepper spray. Many ambulance services and emergency departments use baby shampoo to remove the spray and with generally good effect. Some of the OC and CS will remain in the respiratory system, but a recovery of vision and the coordination of the eyes can be expected within 7 to 15 minutes. Some "triple-action" pepper sprays also contain "tear gas" (CS gas), which can be neutralized with sodium metabisulfite (Campden tablets, used in homebrewing), though it is not water-soluble either and must be washed off using the same procedure as for pepper spray. Pepper spray typically comes in canisters, which are often small enough to be carried or concealed in a pocket or purse. Pepper spray can also be purchased concealed in items such as rings. There are also pepper spray projectiles available, which can be fired from a paintball gun. It has been used for years against demonstrators. Many such canisters also contain dyes, either visible or UV-reactive, to mark an attacker's skin or clothing to enhance identification by police. Pepper spray is banned for use in war by Article I.5 of the Chemical Weapons Convention, which bans the use of all riot control agents in warfare whether lethal or less-than-lethal. In the US, when pepper spray is used in the workplace, OSHA requires a pepper spray "Material Safety Data Sheet" (MSDS) be available to all employees. Nigeria: Assistant Police Commissioner stated that pepper sprays are illegal for civilians to possess. South Africa: Pepper sprays are legal to own by civilians for self defence. Bengal Police started using pepper spray to control opposition movement. China: Forbidden for civilians, it is used only by law enforcement agencies. Less lethal sprays are legal. Hong Kong: Forbidden for civilians, it is legal or possess and use by only the members of Disciplined Services when on duty. Such devices are classified as "arms" under the "Laws of Hong Kong". Chap 238 Firearms and Ammunition Ordinance. Without a valid licence from the Hong Kong Police Force, it is a crime to possess and can result in a fine of $100,000 and to imprisonment for 14 years. They are sold via government-approved companies after performing a background verification. Iran: Forbidden for civilians, it is used only by the police. Philippines: Possession and use for self-defense is legal, and it is freely available in stores. Indonesia: It is legal, but there are restrictions on its sale and possession. Mongolia: Possession and use for self-defense are legal, and it is freely available in stores. Thailand: Use for self-defense is legal, and it is freely available in stores. Possession in a public place can be punished by confiscation and a fine. Taiwan: Legal for self-defense, it is available in some shops. Malaysia: Use and possession of pepper spray for self-defense are legal. Vietnam: Forbidden for civilians and used only by the police. It is an offence to use a pepper spray on anyone for reasons other than self-defense. Saudi Arabia: Use and possession of pepper spray for self-defense are legal. South Korea: Pepper sprays containing OC are legal. Requires permit to distribute, own, carry pepper sprays containing pre-compressed gas or explosive propellent. Japan: There are no laws against possession or use, but using it could result in imprisonment, depending on the damage caused to the target. Singapore: Travellers are prohibited from bringing pepper spray into the country, and it is illegal for the public to possess. Israel: OC and CS spray cans may be purchased by any member of the public without restriction and carried in public. In the 1980s, a firearms license was required for doing so, but these sprays have since been deregulated. Austria: Pepper spray is classified as a self-defense device. Pepper sprays may be owned and carried by adults without registration or permission. Justified use against humans as self-defense is allowed. Belgium: Pepper spray is classified as a prohibited weapon. Possession is illegal for anyone other than police officers, police agents (assistant police officers), security officers of public transport companies, soldiers and customs officers to carry a capsicum spray. It's also authorised after obtaining permission from the Minister of Internal Affairs. Czech Republic: Possession and carrying is legal. Police also encourage vulnerable groups like pensioners and women to carry pepper spray. Carrying at public demonstrations and into court buildings is illegal (pepper spray as well as other weapons may be left with armed guard upon entry of a courthouse). Denmark: As of January 1, 2019, pepper spray is legal to own and use for anyone over 18 years old. Pepper spray may only be stored and used within place of residence/living, and may not be carried and/or used in public without a specific permit to do so. A permit for public carry and use of pepper spray can be issued to people with documented history of threats and/or stalking against them. Use of pepper spray is subject to §13 of "Straffeloven" which states that self-defense measures has to be carried out in reasonable manner, thus defense against non-violent thieves may not involve pepper spray. Legal use of pepper spray generally require that the defender is attacked with risk of bodily harm. Finland: Possession of pepper spray requires a license. Licenses are issued for defensive purposes and to individuals working jobs where such a device is needed such as the private security sector. However, the Finnish Supreme Court has recently ruled in KKO:2010:7 that owning a pepper spray is in itself not a punishable act; but, on the other hand, carrying one can be punished as a device capable of harming other people. France: It is legal for anyone over the age of 18 to buy a pepper spray in an armoury or military surplus store. It is classified as a Category D Weapon in French law and if the aerosol contains more than 100ml, it is classed as an offensive weapon; possession in a public place can be punished by confiscation and a fine. However, if it contains less than 100ml, while still a Category 6 Weapon, it is not classed as a punishable offence for the purposes of the Weapons law, so if you are controlled, it will be confiscated with maybe a verbal warning given. Germany: Pepper sprays labeled for the purpose of defense against animals may be owned and carried by anyone (even minors). Such sprays are not legally considered as weapons §1. Carrying it at (or on the way to and from) demonstrations may still be punished. Sprays that are not labelled "animal-defence spray" or do not bear the test mark of the Materialprüfungsanstalt [de] (MPA, material testing institute) are classified as prohibited weapons. CS sprays bearing a test mark of the MPA may be owned and carried by anyone over the age of 14. Greece: Such items are illegal. They will be confiscated and possession may result in detention and arrest. Hungary: Such items are reserved for law enforcement (including civilian members of the auxiliary police). Civilians may carry canisters filled with maximum 20 grams of any other lachrymatory agent. However, there is no restriction for pepper gas pistol cartridges. Iceland: Possession of pepper spray is illegal for private citizens. Police officers carry pepper spray as part of their standard equipment. Members of the riot police use larger pepper-spray canisters than what is used by a normal police officer. Ireland: Possession of this spray by persons other the Garda Síochána (national police) is an offence under the Firearms and Offensive Weapons Act. Featuring a range not exceeding 3 metres. Latvia: Pepper spray is classified as a self-defense device. It can be bought and carried by anyone over 16 years of age. Pepper spray handguns can be bought and carried without any license by anyone over 18. Netherlands: It is illegal for civilians to own and carry pepper spray. Only police officers trained in the specific use of pepper spray are allowed to carry and use it against civilians and animals. Norway: It is illegal for civilians. Police officers are allowed to carry pepper spray as part of their standard equipment. Poland: Called precisely in Polish Penal Code "a hand-held disabling gas thrower", sprays are not considered a weapon. They can be carried by anyone without further registration or permission. Portugal: Civilians who do not have criminal records are allowed to get police permits to purchase from gun shops, carry, and use OC sprays with a maximum concentration of 5%. CS is considered a weapon and is not permitted. Police carry OC sprays of higher concentration. Romania: Pepper spray is banned at sporting and cultural events, public transportation and entertainment locations (according to Penal Code 2012, art 372, (1), c). Russia: It is classified as a self-defense weapon and can be carried by anyone over 18. Use against humans is legal. OC is not the only legal agent used. CS, CR, PAM (МПК), and (rarely) CN are also legal and highly popular. Serbia: Pepper spray is legal under the new law as of 2016 and can be carried by anyone over the age of 16. Use against humans in self-defence is legal. Slovakia: It is classified as a self-defense weapon. It is available to anyone over 18. The police recommend its use. Spain: Approved pepper spray made with 5% CS is available to anyone older than 18 years. OC pepper spray, recently adopted for some civilian use (e.g., one of 22 grams, with no registration DGSP-07-22-SDP, is approved by the Ministry of Health and Consumption). Sweden: Requires weapons licence, essentially always illegal to carry in public or private. Issued as supplementary service weapon to police. Switzerland: Pepper spray in Switzerland is subject to the Chemicals Legislation. It may only be distributed to buyers above 18 years of age and against ID evidence. Self-service is not permitted and the customer ought to be made aware of safe storage, use and disposal. The vendor needs to possess the "Know-how for the distribution of particularly hazardous chemicals". Potential mailing has to be shipped as registered courier with the remark "to addressee only". The products must be classified and labelled at least as irritant (Xi;R36/37). Regulations for aerosol packages need to be observed. Sprays with greenhouse relevant propellants such as R134a (1,1,1,2-Tetrafluorethan) are banned. Spray products for self-defense with irritants such as CA, CS, CN, CR are considered as weapons in terms of the gun control law. The weapon purchase permit as well as the weapon carrier permit are required for the purchase of such weapons. In 2009, the Swiss Army introduced for the military personnel the irritant atomizer 2000 (RSG-2000) and is introduced during watch functions. The military bearer permit is granted after passing the half day training. Turkey: It is illegal for civilians. Police forces usually use it. United Kingdom: Pepper spray is illegal under Section 5(1)(b) of the Firearms Act 1968: "A person commits an offence if [...] he has in his possession [...] any weapon of whatever description designed or adapted for the discharge of any noxious liquid, gas or other thing." Pepper spray designed to be used against people is considered a prohibited weapon in Canada. The definition under regulation states "any device designed to be used for the purpose of injuring, immobilizing or otherwise incapacitating any person by the discharge therefrom of (a) tear gas, Mace or other gas, or (b) any liquid, spray, powder or other substance that is capable of injuring, immobilizing or otherwise incapacitating any person" is a prohibited weapon. Only law enforcement officers may legally carry or possess pepper spray labeled for use on persons. Any similar canister with the labels reading "dog spray" or "bear spray" is regulated under the Pest Control Products Act—while legal to be carried by anyone, it is against the law if its use causes "a risk of imminent death or serious bodily harm to another person" or harming the environment and carries a penalty up to a fine of $500,000 and jail time of maximum 3 years. Carrying bear spray in public, without justification, may also lead to charges under the Criminal Code. It is a federal offense to carry/ship pepper spray on a commercial airliner or possess it beyond the security metal detectors at the airport. State law and local ordinances regarding possession and use vary across the country. Pepper spray can be legally purchased and carried in all 50 states. Some states regulate the maximum allowed strength of the pepper spray, age restriction, content and use. California: As of January 1, 1996 and as a result of Assembly Bill 830 (Speier), the pepper spray and mace programs are now deregulated. Consumers will no longer be required to have training, and a certificate is not required to purchase or possess these items. Pepper spray and mace are available through gun shops, sporting goods stores, and other business outlets. California Penal Code Section 12400 - 12460 govern pepper spray use in California. Container holding the defense spray must contain no more than 2.5 ounces (71 g) net weight of aerosol spray. Certain individuals are still prohibited from possessing pepper spray, including minors under the age of 16, convicted felons, individuals convicted of narcotic/drug addiction, individuals convicted of assault, and individuals convicted of misusing pepper spray. Massachusetts: Before July 1, 2014, residents may purchase defense sprays only from licensed Firearms Dealers in that state, and must hold a valid Firearms Identification Card (FID) or License to Carry Firearms (LTC) to purchase or to possess outside of one's own private property. New legislations allow residents to purchase pepper spray without a Firearms Identification Card starting July 1. Florida: Any pepper spray containing no more than 2 ounces of chemical can be carried in public openly or concealed without a permit. Furthermore, any such pepper spray is classified as "self-defense chemical spray" and therefore not considered a weapon under Florida law. Michigan: Allows "reasonable use" of spray containing not more than 18% oleoresin capsicum to protect "a person or property under circumstances that would justify the person's use of physical force". It is illegal to distribute a "self-defense spray" to a person under 18 years of age. It must be purchased in person (i.e., cannot be purchased by mail-order or internet sale) either at a pharmacy or from a licensed firearm retailer (NY Penal Law 265.20 14) and the seller must keep a record of purchases. Virginia: Code of Virginia § 18.2-312. Illegal use of tear gas, phosgene and other gases. "If any person maliciously release or cause or procure to be released in any private home, place of business or place of public gathering any tear gas, mustard gas, phosgene gas or other noxious or nauseating gases or mixtures of chemicals designed to, and capable of, producing vile or injurious or nauseating odors or gases, and bodily injury results to any person from such gas or odor, the offending person shall be guilty of a Class 3 felony. If such act be done unlawfully, but not maliciously, the offending person shall be guilty of a Class 6 felony. Nothing herein contained shall prevent the use of tear gas or other gases by police officers or other peace officers in the proper performance of their duties, or by any person or persons in the protection of person, life or property." Persons over age 14 may carry personal-protection spray devices with their legal guardian's consent. Brazil: Classified as weapon by Federal Act n° 3665/2000 (Regulation for Fiscalization of Controlled Products). Only law enforcement officers and private security agents with a recognized Less Lethal Weapons training certificate can carry it. Also in found reports, According to the new legislation, those who carry a spray and pepper must present a certificate of purchase throughout the period in which they carry the spray, and must present it whenever required by police authority. The problem is that legislation has not yet defined the model for this certificate. Use of pepper spray in Brazilian territory is allowed since the end of 2014. In September of that year, the Committee on Economic Development, Industry and Commerce approved Law 7785/14, by Onyx Lorenzoni ( DEM-RS), which authorizes the marketing and use of pepper spray for the sole purpose of self-defense. Before that law, pepper spray was controlled by the Army and could only be used by security forces. Colombia: Can be sold without any kind of restriction to anyone older than 14 years. Use has not been inducted on the law enforcement officer's arsenal. New South Wales: Possession of pepper spray by unauthorized persons is illegal, under schedule 1 of the Weapons Prohibition Act 1998, being classified as a "prohibited weapon". Northern Territory: Prescribed by regulation to be a prohibited weapon under the Weapons Control Act. This legislation makes it an offence for someone without permit, normally anyone who is not an officer of Police/Correctional Services/Customs/Defence, to carry a prohibited weapon. Tasmania: Possession of pepper spray by unauthorized persons is illegal, under an amendment of the Police Offences Act 1935, being classified as an "offensive weapon". Likewise, possession of knives, batons and other any other instrument that may be considered, "Offensive Weapons" if they are possessed by an individual, in a Public Place, "Without lawful excuse", leading to confusion within the police force over what constitutes "lawful excuse". Self-defense as a lawful excuse to carry such items varies from one officer to the next. Pepper spray is commercially available without a license. Authority to possess and use Oleo-resin Capsicum devices remains with Tasmania Police Officers (As part of general-issue operational equipment), and Tasmanian Justice Department (H.M. Prisons) Officers. South Australia: in South Australia, possession of pepper spray without lawful excuse is illegal. Western Australia: The possession of pepper spray by individuals for self-defence subject to a "reasonable excuse" test has been legal in Western Australia following the landmark Supreme Court decision in Hall v Collins  WASCA 74 (4 April 2003). Victoria: Schedule 3 of the Control of Weapons Regulations 2011 designates "an article designed or adapted to discharge oleoresin capsicum spray" as a prohibited weapon. Queensland: in Queensland, pepper spray is considered an offensive weapon and can not be used for self-defence. Classed as a restricted weapon. This means people would need a permit from the police to obtain or carry pepper spray. Front-line police officers have routinely carried pepper spray since 1997. New Zealand Prison Service made OC spray available for use in approved situations in 2013. New Zealand Defence Force Military Police are permitted to carry OC spray under a special agreement due to the nature of their duties. The Scoville rating of these sprays are 500,000 (sabre MK9 HVS unit) and 2,000,000 (Sabre, cell buster fog delivery). This was as a result of excessive staff assaults and a two-year trial in ten prisons throughout the country. In June 2002, West Australian resident Rob Hall was convicted for using a canister of pepper spray to break up an altercation between two guests at his home in Midland. Despite being sentenced to a good behavior bond and granted a spent conviction order, Hall appealed to the Supreme Court, and Justice Christine Wheeler ruled in Hall's favor, thereby legalizing pepper spray in the state on a case-by-case basis for those who are able to show a reasonable excuse. On 14 March 2012, an individual "dressed in black including a black scarf wrapped around their face" entered the public gallery of the New South Wales Legislative Council and launched a paper plane into the air in the form of a petition to Police Minister Mike Gallacher calling on the government to allow civilians to carry capsicum spray. At University of California, Davis in the United States, the UC Davis pepper-spray incident occurred on November 18, 2011. During a demonstration at the campus, university police pepper-sprayed a group of demonstrators as they were seated on a path. The demonstrators were demanding the release of several people the police had just arrested. ^ "Bear Spray Vs. Dogs: How Effective Is It?". Tbotech.com. 2009-07-04. Retrieved 2011-12-02. ^ "Pepper Spray". Llrmi.com. Retrieved 2011-12-02. ^ "Regulations of the People's Republic of China on Use of Police Implements and Arms by the People's Police". www.lawinfochina.com. ^ "Top 10 Deadliest Weapons". ozytive. June 2013. ^ "Effects Of Pepper Spray". Redhotpepperspray.com. Retrieved 2011-12-02. ^ "Effects of Oleoresin Capsicum Pepper Spray on Human Corneal Morphology and Sensitivity - Vesaluoma et al. 41 (8): 2138 - Investigative Ophthalmology & Visual Science". Iovs.org. Retrieved 2011-12-02. ^ "pg 35" (PDF). Retrieved 2011-12-02. ^ a b "Pepper Spray Update: More Fatalities, More Questions". 27 June 2012. ^ ACLU, Oleoresin Capsicum - Pepper Spray Update, More Fatalities, More Questions, June, 1995, p. 2. ^ a b "Pepper spray's lethal legacy" in Ottawa Citizen. October 22, 1998, p. A1. ^ "Former F.B.I. Agent Is Sentenced to Prison", The New York Times. May 20, 1996, p. B8. ^ "Ex-FBI Agent Pleads Guilty in Conflict-of-Interest Case", The Washington Post. February 13, 1996, p. A12. ^ "Pepper spray study is tainted", San Francisco Chronicle. May 20, 1996, p. B8. ^ Reay DT. Forensic pathology, part 1: death in custody. Clinics in Lab Med 1998;18:19–20; Watson WA, Stremel KR, and Westdorp EJ. Oleoresin capsicum (cap-stun) toxicity from aerosol exposures. Ann Pharmacotherapy 1996;30:733–5. ^ "A Randomized Controlled Trial Comparing Treatment Regimens for Acute Pain for Topical Oleoresin Capsaicin (Pepper Spray) Exposure in Adult Volunteers - Prehospital Emergency Care". Informaworld.com. 2008-09-04. Retrieved 2010-05-30. ^ Fox Labs: Pepper Spray Manufacturer. ^ Young, D., Police Marksman Magazine, July/August 1995 Issue. ^ "Riot Control Agents". Organisation for the Prohibition of Chemical Weapons. Retrieved 20 November 2011. ^ "Hazard Communication". US Department of Labor. Retrieved 13 December 2012. ^ Agbo, Njideka (2018-04-18). "Nigeria: Possession of Pepper Spray an Offence Says Nigerian Police". The Guardian (Lagos). Retrieved 2019-01-03. ^ "Everything you Need to Know about Pepper Spray in South Africa". SecurityPro. 2016-07-21. Retrieved 2019-01-03. ^ "HK Laws. Chap 238 Firearms and Ammunition Ordinance Section 2". Legislation.gov.hk. 2000-05-26. Retrieved 2011-12-02. ^ "A spicy self-defense - The Times of India". The Times Of India. ^ Geeta Padmanabhan; Aarti Dhar (October 19, 2008). "Safety is a right too". The Hindu. Chennai, India. Retrieved May 30, 2010. ^ "Nieuwe wapenwet (New Gun Law)". Retrieved 2008-04-15. ^ K.B. of 10 June 2006 tot regeling van het model, de inhoud, de wijze van dragen en het gebruik van spuitbussen en handboeien door de leden van de veiligheidsdiensten van de openbare vervoersmaatschappijen (B.S. 20 June 2006. ^ "Prevence přepadení" [Prevention of assault] (in Czech). Policie České republiky – KŘP Královéhradeckého kraje (Police of the Czech Republic - Hradec Kralove region KRP). ^ "Lov om ændring af lov om våben og eksplosivstoffer (Delvis lovliggørelse af peberspray) - retsinformation.dk". www.retsinformation.dk (in Danish). Retrieved 2018-12-25. ^ Rigspolitiet (25 December 2018). "Peberspray". Politi. ^ "How your gun permit applications are considered". blog.anta.net. 2007-10-21. ISSN 1797-1993. Archived from the original on 2008-07-03. Retrieved 2008-03-23. ^ Ministerium des Inneren Archived 2007-05-16 at the Wayback Machine on Weapon Laws (German). ^ 175/2003. (X. 28.) Korm. rendelet a közbiztonságra különösen veszélyes eszközökről. ^ "Regolamento concernente la definizione delle caratteristiche tecniche degli strumenti di autodifesa che nebulizzano un principio attivo naturale a base di Oleoresin Capsicum e che non abbiano attitudine a recare offesa alla persona, in attuazione dell'articolo 3, comma 32, della legge n. 94/2009. (11G0142) (GU n. 157 del 8-7-2011)" (PDF). Ministero dell'Interno (Italian Ministry of Interior). 2012-06-01. Archived from the original (PDF) on 2012-05-11. ^ "Rozdział 2. Zasady i warunki wydawania, cofania pozwoleń na broń, rejestracji broni oraz dysponowania bronią i amunicją". Ustawa o broni i aminucji (in Polish). Marszałek Sejmu Rzeczypospolitej Polskiej. 2004-03-18. pp. art. 11. Retrieved 5 May 2011. ^ "Статья 3 Закон об Оружии. Гражданское оружие - Кодексы и Законы РФ + Судебная практика". ^ "Приказ Министерства здравоохранения и социального развития РФ от 22.10.2008 N 583н "О разрешении к применению слезоточивых и раздражающих веществ в составе патронов к газовому оружию, механических распылителей, аэрозольных и других устройств гражданского оружия самообороны"". ^ Вукосављевић, Данијела. "Гасни спреј и електрошокер дозвољени по новом закону". ^ "Každá žena sa môže stať obeťou trestného činu, buďte preto opatrné a pripravené". 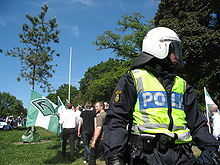 ^ Polisen. "Knivar och andra farliga föremål". ^ "Regulations Prescribing Certain Firearms and other Weapons, Components and Parts of Weapons, Accessories, Cartridge Magazines, Ammunition and Projectiles as Prohibited or Restricted (SOR/98-462)". Retrieved 2012-08-18. ^ "Page not Found - Page non trouvé". laws-lois.justice.gc.ca. ^ Crawford, Tiffany. "Vancouver police warn of criminal charges for carrying bear spray in the city". ^ "States With Pepper Spray Restrictions | eBay". www.ebay.com.au. Retrieved 2018-02-13. ^ a b "Pepper Spray (Mace/Tear Gas) - Consumer Wiki". consumerwiki.dca.ca.gov. Retrieved 2017-11-13. ^ "M.G.L - Chapter 140, Section 131". Mass.gov. 2008-10-29. Retrieved 2011-08-16. .
^ "Florida Statues 790.01 Unlicensed carrying of concealed weapons or concealed firearms". ^ "Florida Statues 790.053 Open carrying of weapons". ^ "Florida Statues 790.001 Definitions". ^ "Michigan Penal Code 750.224d Self-defense spray or foam device". Legislature.mi.gov. Retrieved 2011-12-02. ^ "§ 18.2-312. Illegal use of tear gas, phosgene and other gases". law.lis.virginia.gov. Retrieved 2018-06-29. ^ "RCW 9.91.160: Personal protection spray devices". Apps.leg.wa.gov. Retrieved 2010-05-30. ^ "Sale and Distribution of OC Products to Private Citizens" (PDF). Retrieved 2011-09-23. ^ "Wisconsin State Legal Statutes 941.26". Retrieved 2011-09-23. ^ "Weapons Prohibition Act 1998 - Schedule 1". Retrieved 2017-04-10. ^ "Weapons Control Act". Archived from the original on 2012-12-23. Retrieved 2009-02-08. ^ Police, South Australia. "Firearms and weapons". ^ a b Anne Calverley, 'Judge clears use of pepper spray', The West Australian, 28 March 2003, 1. ^ "Dealing with confrontation". Queensland Police. Retrieved 2018-12-09. ^ "Arms (Restricted Weapons and Specially Dangerous Airguns) Order 1984". Parliamentary Counsel Office. ^ Broadstock, M. (2002) What is the safety of "pepper spray" use by law enforcement or mental health service staff?, NZHTA Tech Brief Series 2002; 1(2). ISBN 1-877235-39-3. ^ Hall v Collins  WASCA 74 (4 April 2003). ^ Tovey, Josephine (March 15, 2012). "Flight of the MacQuarie Street Ninja". The Sydney Morning Herald. Look up pepper spray in Wiktionary, the free dictionary. Are guns more effective than pepper spray in an Alaska bear attack?